Project: Name new overarching brand that covers various community health programs such as eating, drinking, smoking and obesity. Process: Explore ways to make people feel good about adopting healthy behaviours. Needed a positive, simple and memorable brand to co-exist with other brands logos. 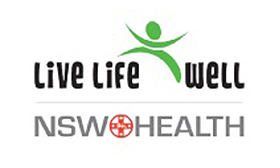 Outcome: “Live Life Well” adopted by NSW Health. Agency Peach. I read this article and found it very interesting, thought it might be something for you. The article is called NSW Healthand is located athttp://www.kbcommunications.com.au/portfolio/nsw-health/.